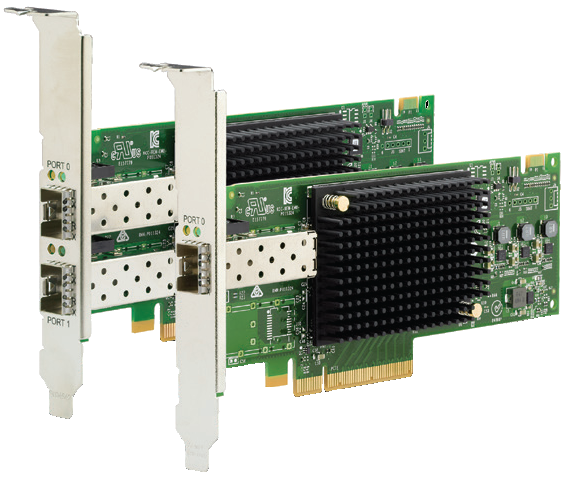 The Emulex 32 Gb 1-port and 2-port Fibre Channel host bus adapters (FC HBAs) for ThinkSystem servers are an ideal solution when requiring high-speed data transfer in storage connectivity for virtualized environments, data backup, and mission-critical applications. This product guide describes the Emulex HBAs and provides essential pre-sales information to understand the products, their key features and specifications, and compatibility. This guide is intended for technical specialists, sales specialists, sales engineers, and IT architects who want to learn more about the adapters and consider their use in IT solutions. The Emulex 32 Gb Fibre Channel host bus adapters (FC HBAs) for ThinkSystem servers are an ideal solution when requiring high-speed data transfer in storage connectivity for virtualized environments, data backup, and mission-critical applications. They are designed to meet the needs of modern networked storage systems that utilize high performance and low latency solid state storage drives for caching and persistent storage as well as hard disk drive arrays. The Emulex 32 Gb FC HBAs feature ExpressLane, which prioritizes mission-critical traffic in congested networks ensuring maximum application performance on flash storage arrays. They also seamlessly support Brocade ClearLink diagnostics through Emulex OneCommand Manager, ensuring the reliability and management of storage network when connected to Brocade FC SAN fabrics. The Emulex 32 Gb FC HBAs have an advanced ASIC which can achieve 1.6M IOPS on a single port by using Emulex's Dynamic Multicore architecture, which dynamically scales HBA resources to either port of a dual-port adapter as needed. This is essential when ports are used in active-standby mode. The adapters can provide near limitless scalability to support maximum VM density, with 2x more on-chip resources and bandwidth. These low latency HBAs can also improve your VDI experience, providing noticeable improvements during boot storms, and allow faster data warehousing and meet the massive bandwidth requirements of flash storage arrays. The following table lists the ordering information for the adapters. The following table lists the fiber optic cables that are available from Lenovo. Maximum performance with up to 1.6 million IOPS per adapter to support larger server virtualization deployments and scalable cloud initiatives, and performance to match new multicore processors, SSDs/flash storage, and faster server host bus architectures. The unique Emulex Dynamic Multi-core Architecture delivers high performance and more efficient port utilization than other HBAs by applying all ASIC resources to either port of a dual-port adapter when the other port is not being used. Supports Brocade Clearlink diagnostics, which helps ensure optical and signal integrity for Fibre Channel cables and optics by validating the health, reliability and performance of the network prior to, and after, deployment. Allows the IT administrator to detect faulty cables and optics in minutes versus hours. Brocade ClearLink is also seamlessly integrated into Emulex OneCommand. Offer end-to-end Quality of Service (QoS) application prioritization with ExpressLane technology, which allows customers to prioritize faster storage traffic (such as SSDs) ahead of slower traffic (such as spinning hard drives), alleviating potential bottlenecks from slow storage. Frame-level multiplexing and out-of-order frame reassembly increases link efficiency and maximizes HBA performance. vScale performance and scalability: Multicore ASIC engine with eight cores supports 255 VFs, 1024 MSI-X, and 16127 logins/open exchanges for maximum VM density. The Emulex OneCommand Manager enterprise class management application features a multiprotocol and cross-platform architecture that provides centralized management of all Emulex HBAs. VMware vCenter plug-in provides OneCommand support within a VMware environment. GreenState power efficiency reduces data center power consumption and associated operational expenses by delivering exceptional power to port ratios. End-to-end data protection with hardware parity, CRC, ECC, and other advanced error checking and correcting algorithms, which ensures that data is safe from corruption. Support Forward Error Correction (FEC), a new feature that provides enhanced data reliability and performance by automatically detecting and recovering from bit errors. T10-PI data integrity with high performance offload provides end-to-end data corruption protection. Rock-solid reliability and thermal characteristics, which are essential for mission-critical, cloud, and virtualized applications. Emulex HBAs are renowned for reliability, ensuring maximum SAN uptime. Their "it just works” reputation is based on 17 million installed ports with proven industry-leading reliability of 10 million hours field Mean Time Between Failures (MTBF). Support for 32 Gb, 16 Gb, 8 Gb, and 4 Gb FC devices. Comprehensive virtualization capabilities with support for N_Port ID Virtualization (NPIV). A common driver model allows a single driver to support all Emulex HBAs on a given OS. Reduces the number of cards, cables, and PCIe slots required. Exceptional performance per watt and price/performance ratios. Integrates seamlessly into existing SANs. Allows application of SAN best practices, tools, and processes with virtual server deployments. Ensures data availability and data integrity. Detailed and real-time event logging and tracing enables quick diagnosis of SAN problems. The beaconing feature flashes the HBA LEDs, simplifying their identification within server racks. The environmental monitoring feature helps optimize SAN availability. The following table compares features of Emulex 32 Gb HBAs with previous generation adapters. Hot-pluggable 32 Gbps Fibre Channel SFP+ short wave optical transceivers (850 nm) with LC connectors (included with the adapters). Note: Other transceivers are not supported. Emulex AutoPilot Installer automates the HBA installation process and reduces time to deployment and administrative costs. Automated installation and configuration of driver and management tools simplifies deployment of multiple adapters within Windows environments. A single installation of driver and management application eliminates multiple reboots and ensures that each component is installed correctly and the HBA is ready to use. The Emulex OneCommand Manager application enables centralized discovery, monitoring, reporting, and administration of Emulex HBAs and CNAs on local and remote hosts. Powerful automation capabilities facilitate remote driver parameter, firmware, and boot code upgrades. In addition to the GUI interface, management functions can also be performed through a scriptable command-line interface (CLI) and a web browser. Emulex management instrumentation complies with Open Management Standards, such as SMI-S and common HBA API support, which enables seamless upward integration into enterprise storage and server management solutions. The following table lists the ThinkSystem servers that are compatible. Tip: These tables are automatically generated based on data from Lenovo ServerProven. 1 The WWPN show wrong when created by excute FC-NPIV test under VM6.5.2 os. The adapters carry a one-year limited warranty. When installed in a supported server, the adapters assume the servers’s base warranty and any Lenovo Services warranty upgrade. Xeon® is a trademark or registered trademark of Intel Corporation or its subsidiaries in the United States and other countries.